Artificial intelligence, virtual reality, and the Internet of Things are common buzzwords these days, but so often, businesses and individuals alike think of each in its own silo. That’s a disservice to emerging tech because combining each concept’s strengths will lead to solutions previously unimagined. IoT, for example, doesn’t work on a hub-and-spoke model. Currently, the technology operates mostly on the IFTTT model — i.e., “if this, then that” — but relying on AI instead will create smarter, more granular connectivity. This isn’t a farfetched concept: AI requires data, which IoT generates, so it’s a match made in heaven. And VR brings it all together with an immersive visualization of the data, creating heightened simulations that enhance users’ experiences and understanding of a scenario. Look at the Tour de France as an example. Today’s cyclists are heading into this summer’s race with significantly more information than previous competitors have been able to afford. Before the race begins, trainers with 360-degree cameras run routes so cyclists can get familiar with them through a VR simulation. Machine learning then uses historical data about the weather, environment and other cyclists to forecast racing conditions. Once the race is underway, heart rate monitors track movement efficiency, while a GPS and other sensors gather data on the bike. Alone, each feature is helpful — there’s no arguing that. But when brought together, users (the cyclists) find themselves in a heightened, immersive experience with the potential to prepare them for the race like no previous cyclists before them. And this is just one example. IDC research shows spending on these next-gen technologies grew an estimated 17 percent in 2017 and will only accelerate over the next five years. In other words, we’re set to see a lot more interplay between the three technologies in the not-so-distant future. These technologies’ intersection has the potential to disrupt industries such as design, maintenance, logistics and many other fields. On the factory floor, for instance, IoT sensors collecting data on machinery enables predictive maintenance. And the ability to provide a remote visual to technicians in real-time can revolutionize the process. These technologies working in tangent provide the ability to zero in on problems much more effectively. Consider another example: At my company, we are designing IoT sensors and solutions within the heavy equipment industry, building edge- and cloud-based analytic engines to address geospatial understanding, ring-fencing data and sensor-based performance details, to name a few areas. We are also digitizing this content for training and maintenance within this industry. In the heavy machinery industry, equipment idle time is a huge loss and makes machines prone to theft or misuse. Putting sensors for measuring various parameters such as engine parameters, fuel monitoring, and hydraulic pressures provides real-time analytics on the usage patterns. This demonstrates how a machine can be better utilized or flag any misuse, substantially improving the profitability and user experience for a company. Instances of this three-way intersection are happening across industries — and this trend is already leaking into the consumer market. Smart home sensors are becoming more prolific on the consumer market, and they’re beginning to do more with the data they generate via IoT. Everything from ambient temperature and air quality to lights, electricity, and even human activity can be monitored these days. There’s no shortage of data platforms, and IFTTT is currently serving as a break-fix to help with automation and other smart use cases. The amount of data a person can collect in the home is astounding. Nest controls your heating and cooling, collecting historical data of usage patterns. CURB connects to your fuse box to gather data on every outlet. Netatmo measures air particles, humidity and even noise. All this data can be overwhelming, and finding insights can feel like searching for a needle in a haystack. However, once AI is trained to work with all this information, it won’t be long before our home lives are improved. 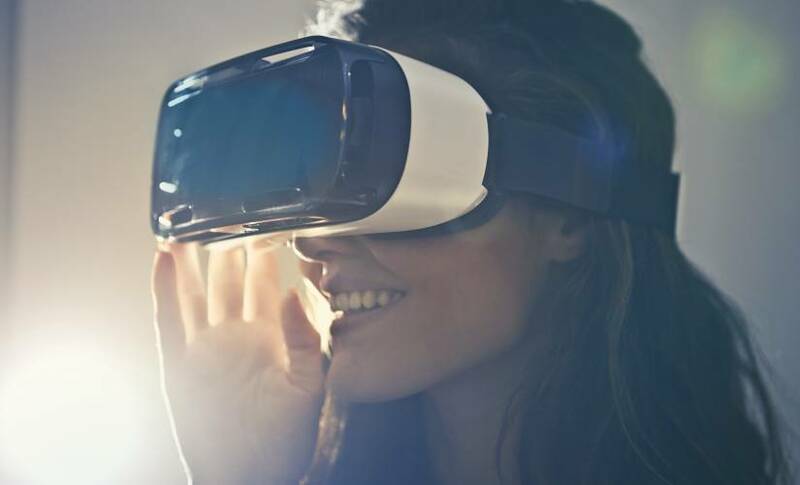 VR enters the picture in scenarios like renovations or insurance evaluations — when contractors are able to virtually tour your home from their office, it streamlines processes significantly. The use cases don’t stop there; these technologies are combining to improve our lives outside the home as well. Guru, for instance, is using VR to bring static museum artwork to life. AI is used to distinguish between buildings, objects and people in exhibits to identify themes. From there, it brings digital life to the figures and environments, immersing visitors in a whole new way to appreciate the art world. And public transportation can be improved by this technology intersection: Eye Create Worlds has a proof of concept in which a network of IoT sensors are placed throughout a city to allow a remote operator to optimize rail transportation networks in VR. As AI develops further potential of running on the edge, these three technologies’ relevance will only increase in significance. Their intersection is the key to unlocking the full potential of IoT applications. And VR is capable of so much more than entertainment and gaming; their greatest uses are in training and diagnostics — and AI and IoT sensors will make that more apparent as we move forward. In the digital journey, AI, IoT, and VR are all significant levers to redefine processes for both businesses and consumers. But it’s the combination of the three that will be the most disruptive. For entities looking to effect change, the key is to identify the right opportunity within this intersection and implement a pragmatic solution to leverage all three technologies together. K.R. Sanjiv is the Chief Technology Officer for Wipro Limited. The views expressed in this article are his own and his employer does not subscribe to the substance or veracity of these views.